Drosophila is small flies commonly called fruit flies, vinegar flies, pomace flies or wine flies commonly attracted to fruit, wine, and vinegar. They lay up to 500 eggs at a time which hatch in 7-10 days making them a huge nuisance. They lay eggs on anything from ripe fruits, food debris, wine and vinegar to garbage disposal, sink drains, even damp sponges and mops. The best way to get rid of fruit flies is to keep your house squeaky clean with no food debris, ripe fruit or empty wine and vinegar bottles lying around for the flies to feed on or lay eggs in. All the kitchen counters should be clean and the dishes washed immediately after easting so that they don’t provide a breeding ground for flies. Fruit should be washed and then either refrigerated or kept in brown paper bags; otherwise, it would attract more flies. 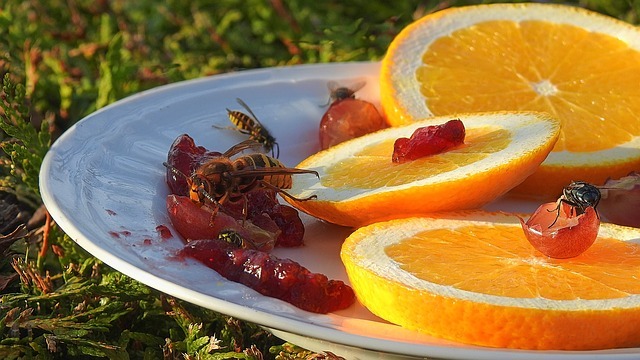 If placed in bowls on the kitchen counter the fruit should be covered to prevent fruit flies from feeding on it. Leftover or over ripe fruits should be immediately discarded. Fruit and food materials in the garbage can also provide another good food source for flies, therefore, the house dustbin should have a lid on it to prevent flies from entering it. Refrigerating or freezing the fruit and then throwing them in the garbage when it is about to be taken is another way to prevent fruit flies. Even after keeping everything clean they can still lay eggs in hard to reach places. Sprays can be used to kill these flies but it won’t take care of the eggs and larvae that will soon hatch and then again infest your house. There are certain traps available in hardware stores that will effectively trap and kill flies. Disposable fruit fly traps contain non-toxic bait for the flies and can catch up to 2000 flies lasting for a month. Homemade traps can also be made from jars by placing a cone-shaped paper funnel at its mouth, filling the jar with a bait like vinegar or red wine and placing it in an area which is most frequented by fruit flies. These flies enter the jar but cannot find their way back out and end up being trapped. This method will require you to either take them someplace else and release them or again use the spray to kill them. Another better method is to add some drops of dishwashing liquid into the bait, this liquid will break the surface tension of vinegar and wine so that when the flies come they instantly fall inside the bait and die. This method will require you to change the liquid every two to three days but will save you from using any sprays. Another way to get rid of fruit flies is to place a rue plant in your kitchen since the smell of the plant drives away flies. This is very much similar to placing cloves in sugar and honey to prevent ants. Fruit flies reproduce rapidly as they lay the large number of eggs which hatch in 7-10 days, therefore, getting rid of them prove to be quite difficult. Some of the best ways to get rid of fruit flies are to clean your whole house from top to bottom. Fruits should either be refrigerated, kept in brown paper bags or in covered bowls to prevent flies from sitting on them. Dustbins should be covered and leftover food and fruits refrigerated and discarded before the garbage is to be taken to prevent flies from making the garbage their breeding ground. Sprays can be used to kill them. Commercial traps can be bought to get rid of flies. Homemade inexpensive traps can be made to successfully trap and kill flies. These homemade traps can be made using jars by placing a cone-shaped paper funnel inside these jars and putting bait like vinegar or wine at the bottom of the jar. When a few drops of dishwashing liquid is added into vinegar or wine it causes flies to fall in the liquid, effectively killing them. Another way to ward off flies is to place a rue plant in your kitchen as flies don’t like its smell and fly off leaving your kitchen alone.